Timeless popular character, pure, rare and enduring symbol of being pure platinum (Pt1000) material used as the eternal white platinum continue to shine in a reproduction of the Gundam's charm and shine forever maintain that success. 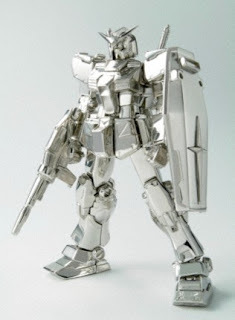 The material is pure platinum (Pt1000), the weight of 1400 g.
This approach is GINZA TANAKA platinum to the creation of new value and that they wanted to, the characters Gundam world would like to have one of Bandai match made. A Gundam made of pure platinum, and with a 0.15 carat diamond mounted to the head, will be displayed at BaselWorld 2007, a watch and jewelry show. 89 thousands of sophisticated built-up parts to be designed for the delicate and noble impression in the finish. At present, this work is not expected to be sold, as a reference price is US $ 250000 worth. Posted by Beezy at Thursday, November 29, 2007 . To call Guerlain's KissKiss Gold and Diamonds lipstick the most expensive lipstick in the world may be a mistake. A replica of Echaudemaison and designer Herve Van Der Straeten's original 2005 KissKiss lipstick case, KissKiss Gold and Diamonds is aptly named. It's made with 110g of solid 18-carat gold and 199 diamonds (2.2 carats in total). So precious is this lipstick case that it comes with a black lacquered wooden case in which to store it. Really, though, it's the luxurious case that makes this lipstick sparkle. They're also known for creating the first automatic lipstick and the first solid lipstick. This isn't Guerlain's first lipstick marvel. The world's most expensive lipstick kit is only available by private appointment at Guerlain Boutiques at Bergdorf Goodman, Neiman Marcus San Francisco, The Breakers West Palm Beach and Epcot. Sure, it comes in fifteen shades hand-selected by renowned French makeup artist Olivier Echaudemaison. The first mid-engine sports car by Audi featured in the Bergdorf Goodman 2007 Holiday Gift Book will be in a sealed-bid auction from November 16th, 9am EST to December 14th, 5pm EST. With a starting bid price of $160,000 the Audi R8 will be customized with the assistance of Tony Chi to the winner's specifications. The Audi R8 has a 420 hp V8 4.2L FSI engine and a rear-based quattro® all wheel drive system. All proceeds will be donated to charity which gives this fancy purchase some philanthropic appeal as well. The property includes a luxury lodge that sits on a 160-acre lake with five miles of the Red River and sandy beaches. Not too many pictures of the 6,000-square-foot lodge at the listing but what there is looks very rustic. Legacy Ranch is actually a hunting business that is endorsed by Orvis as one of the premier Wing-Shooting Lodge Programs. Legacy Ranch is listed at $14 million but I can't seem to find any information on just how much acreage it includes. The land is home to trophy elk, white tail deer and bison as well as turkey, quail, pheasant and wild boar. We are headed back to the South again for a look at another hunter's paradise. 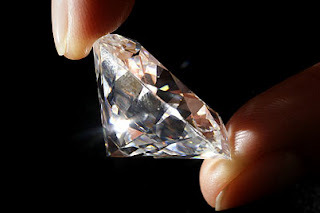 The jewel  the white, has flawless clarity, and its cut, polish and symmetry have all been graded excellent, it said. Marciano's winninlargest top-quality, brilliant-cut white diamond ever to appear at auction  had been valued by Sotheby's at between $13.3 million and $17.8 million. An 84.37-carat white diamond touted by Sotheby's for its size and beauty sold at auction to Guess clothing company founder Georges Marciano for just under $16.2 million. It was just short of the all-time auction record for a stone or piece of jewelry, a record held by the same Sotheby's branch in Geneva for a 100.1-carat diamond that fetched $16.5 million in 1995. "In my 32-year career, this stone ranks among the most beautiful diamonds I have ever seen," said David Bennett, the auction house's chairman of jewelry for Europe and the Middle East. The diamond has received the highest possible grading, Sotheby's said. The sale last week fetched $269.7 million, well short of estimates, and led some analysts to speculate whether the flight from risk currently gripping financial markets may be spilling over into the art world. The New York-based company is hoping the "Magnificent Jewels" sale at Geneva's historic Beau Rivage hotel will help it bounce back from the disheartening results of its Impressionist and Modern Art auction, which sent its stock tumbling. He called it a magnificent and unique stone. It is D-color, or finest g bid, made by telephone, came to $16,189,769 including the buyer's premium. Both versions are single seaters, but the electric features an electric horn and speedometer with a top speed of 3 mph, while the pedal version will go as fast as your little tyke can pedal. It's available in two different versions - electric ($450) and pedal ($275). From interactive video game systems and kid friendly cell phones to creating your own world online, anything with batteries or an electrical plug is where it's at. Gone are the days when kids played with wooden toys, colored in coloring books and played with Barbie and GI Joe. So parents, step up to the challenge and knock your kid's socks off with their very own car. BMW has graciously brought you the M6 Convertible. And no, I'm not talking about a Power Wheel, I'm talking about a car. Today, it seems to be all about hi-tech gadgets. Posted by Beezy at Friday, November 16, 2007 . The cream of the crop is officially all in one spot as the Robb Report, a global luxury source, recently released their limited edition series of rare items and unforgettable trips. Imagine surprising someone with one of these unique gifts for the holidays! From timepieces to cars, jewelry to wine, and trips to Aspen or Manhattan this list has something special for everyone and is bound to trip your trigger for must-haves. But don't wait too long -- the items went live for purchase a few days ago. There are so many versions to choose from -- some just for the race track, some for road warriors, and some just for a select few consumers to test drive for the Prancing Horse company such as the Ferrari FXX Evoluzione which was revealed just a few weeks ago. Keep in mind if you can't afford the real thing the Ferrari store has miniature versions of their cars and plenty of apparel to temporarily satiate your Ferrari lust. I for one cannot imagine driving a car with 800+ horse power but I am sure some of you speed-demons can already feel the wind whizzing through your hair. I am not a car connoisseur by any means but the sensational red sports cars produced by Ferrari are eye-candy to anyone. With 860 HP, shift times at lightning speeds of 60 milliseconds, and an adaptable, in-cockpit adjustable traction control system its no wonder why this baby is getting so much attention! Well, considering the price tag and beauty attached to it, I would love to buy this pair and won't dare to carry it. It's time to remove the dust from the money piling in your bank account and tie some art work to your feet. If this precious gold heel gets success in winning your heart then try saving some bucks right away. The 18 karat gold heels are quite sensuous and ufffff when it is complemented with the hand dyed silk petals. Of course, it is far cheaper than the world's most expensive sandals. Crafted by Mai Lamore, don't degrade them by tagging them as mere shoes as they are no less than a work of art. The pricey artistic cutting-edge street wear demands a whooping sum of $27,945. Pinch yourself as this is possible. It would be my luxurious installed masterpiece.